With the river really high during the week I thought we’d be back on the pond again but not too much of the wet stuff as we approached the weekend and it started to look like we might actually get on the Isle. I popped down on Saturday and it looked lovely with a tinge of colour and pace although the forecast was for it to get really cold overnight which wouldn’t do us any favours and for added joy, I’d been struck down with a life threatening strain of man flu! 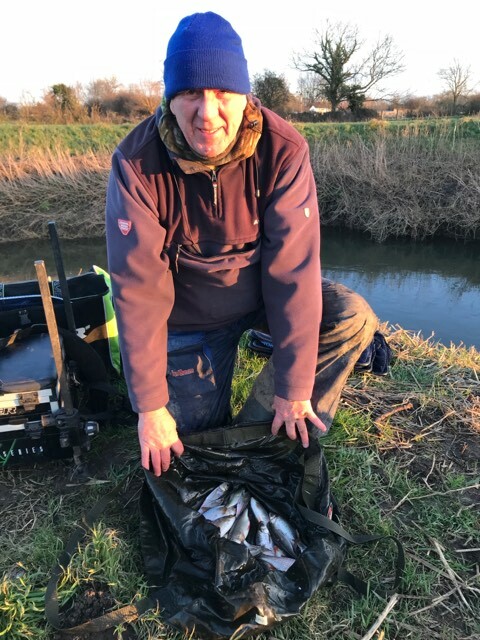 It was certainly chilly in the morning but not as cold as I thought it was going to be, I got to the bowling club for the draw and we had a slightly depleted turnout although we did have another new face as Somerset Angling superstar Steve Kedge was joining us for the day. 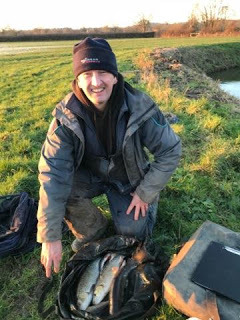 With the two pegs below Hambridge in for the first time this series, everybody wanted to draw there as they were expected to fish well and of course Kedgie pulled out H1, the first one below and we were sure it would be game over! I pulled out peg 124a again and although I was second off it last time with 5lb 12oz, I was expecting the river to fish a lot better this time around. 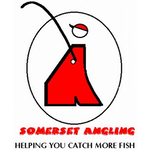 Elsewhere, Adie’s drawing arm continues to be on fire as he pulled out 126 again, Langport invader Baz Morgan drew 125, Karl was on 128 and Rob drew 123. Parker had pulled out H4 above the bridge at Hambridge and there was a good chance he’d take a nugget off me today. I got to the river and was pleased to see the colour hadn’t dropped out completely and thought we’d be in for a good day. I did pop up to have a look at 124 as I had the choice but as I approached something dived underwater as I got there and I don’t know whether it was a bird or one of our furry friends so I decided to stick with my original choice. 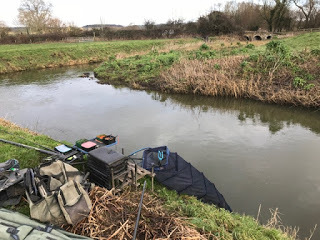 I set up the same two rigs as last time, a 1 gram bodied float to fish the deeper water in the middle of the peg and a 0.6 gram DH16 for fishing across and down the peg in the shallower water, there was a bit more pace on it and the flow on the far side was coming back on itself but I still fancied it as a couple of fish topped as I was setting up. On the side tray I had the usual maggots, casters and Bait-Tech Super Seed hemp. I started with the heavier rig down the middle at 8.5 metres but it was going through a bit too quickly so I added a section and as I inched the float through, it buried and a 2oz roach took my double red maggot hookbait to get me off the mark, two smaller ones followed and I could see Baz was catching as well so I shouted down that they were having a go today. I should have known better as my next fish was a minnow so I switched to caster and had a nice roach straight away but then I was getting loads of little knocks which I was sure were minnows as the caster was coming back with just the end nipped off. I had a couple of gudgeon but after a promising start I was now struggling, I could see Baz slipping his landing net out on a regular basis but he said they were only small chublets that he was netting because he was sat high up (they didn’t look that small to me!). I had some steadier water on the inside and had been flicking a few casters down there so gave it a go and had yet another minnow but then my next fish was nice roach and I thought I’d cracked it but it was a one off. I was feeding casters across where I’d caught the two chub last time but didn’t want to go over too soon so plugged away catching gudgeon and the odd decent roach. 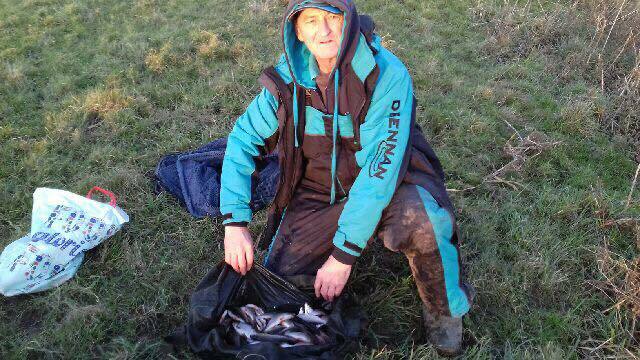 Baz was pulling away and already had around twenty five fish. Nick Payne arrived for walk and went up to see Rob, when he came back he reported that he was catching small fish well, while he was with me I only added a gudgeon to my meagre tally and as the wind was rather keen he soon left me to it and headed for the sanctuary of his nice warm car. I was still catching the odd good roach but couldn’t seem to catch two from the same spot although when I got one they were a good stamp. The next visitor was Karl who walked up from 128 and said he hadn’t had a bite but Adie was catching well on 126. 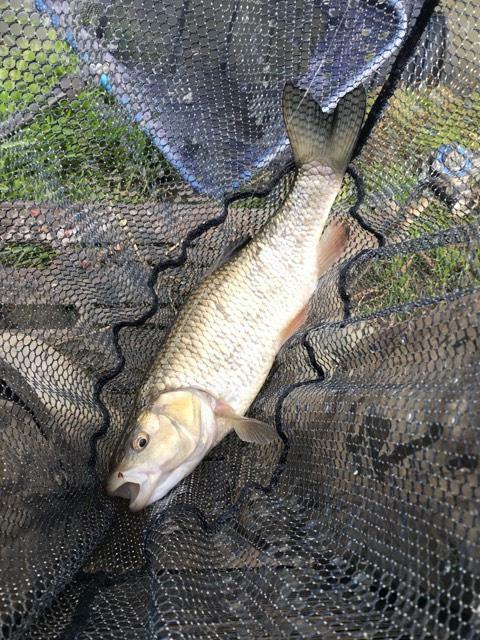 I was running the float through but every now and again I’d get snagged which was starting to get annoying so started going further down the peg and had a few knocks, I just went to lift the rig up and there was a decent fish on, I played it carefully and slipped the net under a nice chub around a pound and a half. Karl headed back to his peg and I’m sure I heard him mutter ‘jammy git’ under his breath! I stuck at it a bit longer but no more bites and I was itching to try across where I’d been feeding casters and hemp for two and a half hours. I picked up the shallower rig and stuck another section on and went across, the first bite resulted in a one ounce roach which wasn’t what I’d hoped for so I tried further along and held the rig there, after a few minutes, a really positive bite saw solid resistance on the strike and I shipped back so the fish was I the middle of the peg, to be honest it didn’t give me too many problems and I netted a nice chub, this one around 2lb. 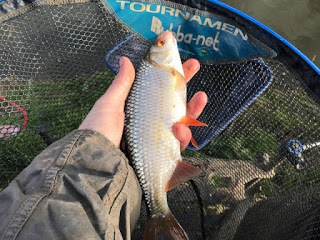 With over two hours left, I really thought I’d get a few more but it didn’t really happen, I did have another nice roach but I knew I needed another couple of chub if I was going to challenge Baz. I decided to rest the far side for a bit and came back in the deeper water, the good news was that I wasn’t getting any minnow trouble but the bad news was that I wasn’t getting any bites at all now! I did have another gudgeon but with around thirty minutes left, I was just going to give that up as a bad job when the float shot under and another good fish was on, this one was quite angry and I breathed a sigh of relief when I slipped the net under my third chub, this one was 2lb plus. Into the last half an hour and I went back across where hopefully the rest had done it some good, it turned out to be a bit of an anti-climax although I did have one more good roach. I ended up with 27 fish (three chub, roach and gudgeon) plus minnows and I thought I had between 7-8lb. I packed up and as Rob had the scales, went up to weigh him in, he was still putting his kit away so suggested I grab the scales and weigh Baz in first. 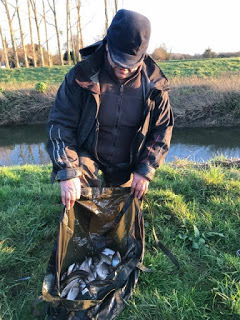 Baz said he’d had a really nice days fishing and when he pulled his net out, he had a lovely bag of fish including some chunky chublets, the needle swung round to 10lb 14oz and I knew I didn’t have that. Rob was next and had loads of fish for 4lb 12oz, then it was my turn and my fish went 8lb 10oz and as I suspected I needed another chub. Back at the cars and Adie had won the section with a cracking net of quality roach weighing 14lb 6oz so I ended up third in the section which hasn’t done my league any favours. 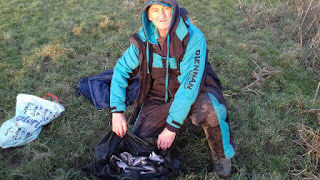 So a nice days fishing for most of those at Isle Brewers but I do find it fascinating when an area like Hambridge doesn’t fish, Kedgie never had a fish for four hours but then they’ve decided to feed and he said there were a lot of fish there in the last hour or so, what prompted them to feed then? 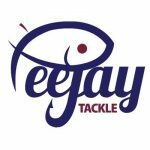 I guess us anglers don’t have all the answers, it’s like some of the chub pegs, they won’t produce week in, week out but I’ve heard people say there were no fish there, I just don’t believe that. Todays result puts me in third place but I’m a long way behind Adie and realistically any chance of winning the league has now gone unless he blows out big time and I just can’t see that happening. We’ve had seven different winners so far with Frank Woodard and Adie Bishop the only anglers to win more than one match.